Here is yet another great Tory lie exposed – “Making work pay”. This Government have raided our tax-funded welfare provision and used it to provide handouts to the very wealthy – £107, 000 EACH PER YEAR in the form of a tax cut for millionaires. 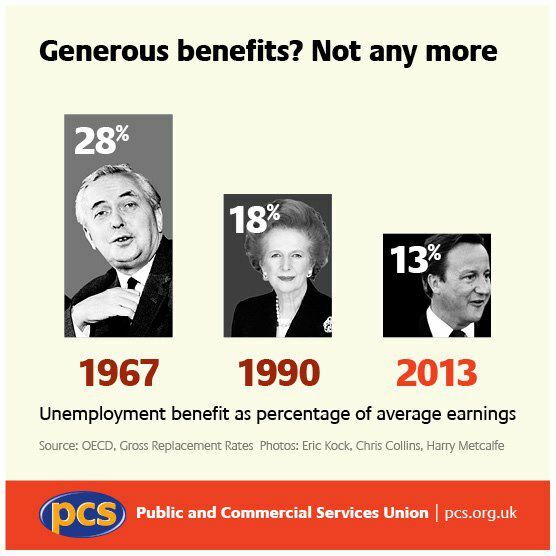 The Conservatives claim that it is “unfair” that people on benefits are “better off” than those in work. But the benefit cuts are having a dire impact on workers as well. People in work, especially those who are paid low wages, often claim benefits. Housing benefit, tax credit and council tax benefit are examples of benefits that are paid to people with jobs. Indeed the number of working people claiming housing benefit has risen by 86 percent in three years, which debunks another Tory myth that benefits are payable only to the “feckless” unemployed. By portraying housing benefit as a payment for “the shirkers”, not “the strivers”, Cameron and Osborne aim to convince the public that their draconian, unprecedented welfare “reforms” are justified. 60 percent of people visiting food banks last year were in work. But unemployment benefits are just 13 percent of the national average earnings. What Cameron’s Government have done is created extreme hardship for many of those in work, and further severe hardship for those who are unemployed. “Making work pay” is a big lie that has benefited no-one but the very wealthy, and the reduction in both the value and the amount of welfare support for unemployed individuals has come at a time when we are witnessing steady reductions in worker’s rights, and worryingly, the Tory-led Government is stepping up its attack on employment health and safety regulations. And the unions. Last week, on the 25th April 2013, the Enterprise and Regulatory Reform Bill was granted royal assent, bringing into law the Government’s widely unpopular proposals to scrap employers’ 114-year-old liability for their staff’s health and safety in the workplace. This steady erosion of our fundamental and hard-earned rights in the workplace is linked to the steady erosion of the basic human rights of the poorest citizens. The Government have liberated wealthy private companies of any moral or legal responsibilities, so that they can simply generate vast profits by exploiting workers who have increasingly fewer means of redress. 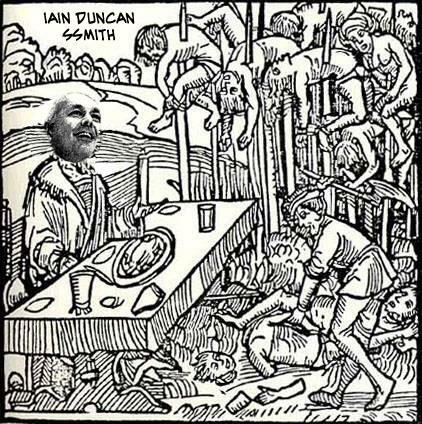 There is also a growing reserve army of labour that may be exploited via the workfare schemes. This will mean that unscrupulous, greedy, profit-driven employers will increasingly replace paid workers with unpaid ones that are forced to work for their benefits or face losing them. This is a politically enforced programme of reducing the population’s expectations regarding choice, opportunities, rights, and quality of life. A recent proposal from our “caring Conservatives” is that new in-work claimants should be required to attend an initial interview at a Job Centre “where a conditionality regime should be set up to ensure the individual is doing all they can to increase their hours and earnings”. Claimants “should then be forced to attend a quarterly meeting to be reminded of their “responsibility” to try to increase their earnings”, with sanctions applied for failing to attend. This may well be the next stage of the welfare “reforms”, incorporating a punitive approach to those in work on low hours or low pay, as well as those unfortunate enough to be out of work. There is absolutely no evidence, sense or logic behind the Tory claim that cutting welfare will “make work pay”. Well, unless we are referring to the greedy employers that will benefit and profit from the welfare “reforms” and reduction in worker’s pay level and rights. This is about gross exploitation and profiteering at any cost to human lives. “Making work pay” is an entirely ideologically-driven, dogmatic, absurd and reductionist Conservative superficial soundbite. There is certainly an essence of all that is Tory in the word “peremptory”. There is also many a Tory donor in private business that wants to see more profit and a more abject workforce. 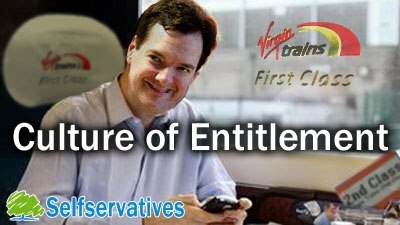 The real “culture of entitlement” is not to be found among poor citizens, those who are unemployed, sick and disabled citzens, as this Government would have you believe. As a matter of fact, most amongst this politically demarcated social group have paid tax and paid for the provision that they ought to be able to rely on when they/we have need of it, it’s ours, after all. The real culture of entitlement emanates from the very wealthy, and is well-fed and sustained by an aristocratic and authoritarian Government. Every time we have periods of high unemployment, growing inequalities, substantial increases in poverty, and loss of protective rights, there is a Conservative administration behind this wilful destruction of people’s lives, and the unravelling of many years of essential social progress and civilised development that spans more than one century in ontogeny and maturation. 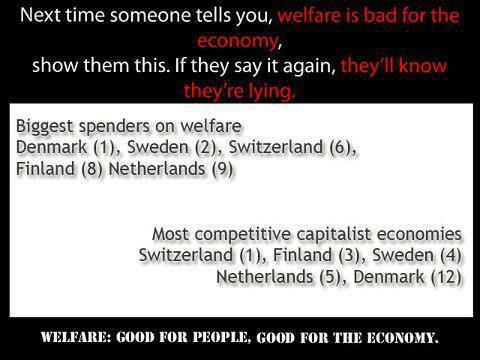 The Conservatives lied about our “generous welfare”. It wasn’t and it certainly isn’t now. Coming at the same time that severe cuts to tax credits and benefits are set to make an estimated 11.5 million households poorer, the Chancellor was accused by Britain’s largest union, Unite, of conducting class war on the poor while giving handouts to the rich. In addition, wages have not risen in real terms since 2003 and there are further fears that the Government is trying to pressurise the Low Pay Commission into cutting the national minimum wage from its present £6.19 per hour. At a time when the cost of living has risen so steeply, the Government has also increased VAT. “But ordinary people – taxpayers – will be furious that George Osborne has chosen to give away £1 billion to the super-rich while their fuel and food costs rise and wages are falling”. Ed Miliband said: “David Cameron and George Osborne believe the only way to persuade millionaires to work harder is to give them more money. Bravo Ed, a very well spotted contradiction regarding Cameron’s claims about how “incentives” work. Apparently, the rich are a different kind of human from the majority of human beings. Falling taxes – top rate of tax cut from 50% to 45% for those earning over £150,000 a year. This is 1% of the population who earn 13% of the income. No mansion tax and caps on council tax mean that the highest value properties are taxed proportionately less than average houses. It’s plain to see that Cameron rewards his wealthy friends, and has a clear elitist agenda, while he funds his friends and sponsors by stealing money from the taxpayer, by stripping welfare provision and public services down to bare bones. A simple truth is that poverty happens because some people are very, very rich. That happens ultimately because of Government policies that create, sustain and extend inequalities. The very wealthy are becoming wealthier, the poorest are becoming poorer. This is a consequence of “vulture capitalism”, designed by the opportunism and greed of a few, it is instituted, facilitated and directed by the Tory-led Coalition. Those are a direct consequence of Coalition policies. The Coalition take money from those who need it most to give away to those who need it least. That causes poverty, and cannot fail to create growing inequality. The Coalition are creating more poverty via the class-contingent consequences of policies. It’s time to debunk the great myth of meritocracy. Wealth has got nothing whatsoever to do with “striving” and hard work. If it were so simple, then most of the poor would be billionaires by now. This week it was reported that one school liaison officer told how a parent came to her pleading for help because her children were suffering from SCURVY – a potentially fatal condition caused by a severe Vitamin C deficiency. It’s an illness linked with malnutrition and poverty, and has seldom been seen in this Country for most of this century, due to improvements in medical knowledge, and the development of adequate welfare provision – that had eliminated absolute poverty in Britain. Until now. It’s increasing again. We now have pre-Victorian Health and Safety laws in the workplace. We have Victorian malnutrition and illnesses such as scurvy and rickets. Malnutrition has resurfaced because of the re-appearance of absolute poverty – something that was eradicated because of our effective, essential welfare program, until now. We have a punitive Poor Law approach to “supporting” the poorest instead of welfare provision. These ideas and subsequent harsh and punitive policies were a dark part of our history, and now they have been resurrected by the Tories to be a part of our future. It’s social regression. We have recession and austerity, entirely manufactured, based on ideology and not because of any economic necessity. Austerity does not include and affect the very privileged. Indeed they have benefited immensely from the politically engineered economic situation. We have a society that has been lulled into forgetting equality, decency and fairness. We have a lying authoritarian Government that created a crisis for many to make profiteering opportunities for a few. The New Poor Law of 1834 was based on the “principle of less eligibility,” which stipulated that the condition of the “able-bodied pauper” on relief be less “eligible” – that is, less desirable, less favourable – than the condition of the independent labourer. “Less-eligibility” meant not only that the pauper receive less by way of relief than the labourer did from his wages but also that he receive it in such a way (in the workhouse, for example) as to make pauperism less respectable than work – to stigmatise it. Thus the labourer would be discouraged from lapsing into a state of “dependency” and the pauper would be encouraged to work. The Poor Law “made work pay”, in other words. The clocks stopped the moment that the Tories took Office. Now their policies mean that we are losing a decade a day. Employment Support Allowance claim update: Exceptional Circumstances – Regulations 25 and 31 and Universal Credit.